One of my favorite aspects of social media is coming across amazing work by activists, creatives, and academics. I get especially excited to see work by fellow women of color, whose perspectives are often left out of mainstream media and activism. So naturally, when I discover that posts by women of color are being filtered out of my feed, I am skeptical and upset but not surprised. This recently happened as I was using Gobo, a social media aggregator and filtering platform created by my colleagues at the MIT Center for Civic Media. Gobo was designed to address the lack of knowledge and control that people have over how their social media feeds are filtered. It aims to give power back to the user by allowing users to adjust how their feeds are filtered along six categories: politics, seriousness, rudeness, gender, brands, and obscurity. When the user changes the filters for each of these categories, posts will either get filtered in or out of their feed, and Gobo will tell them why. 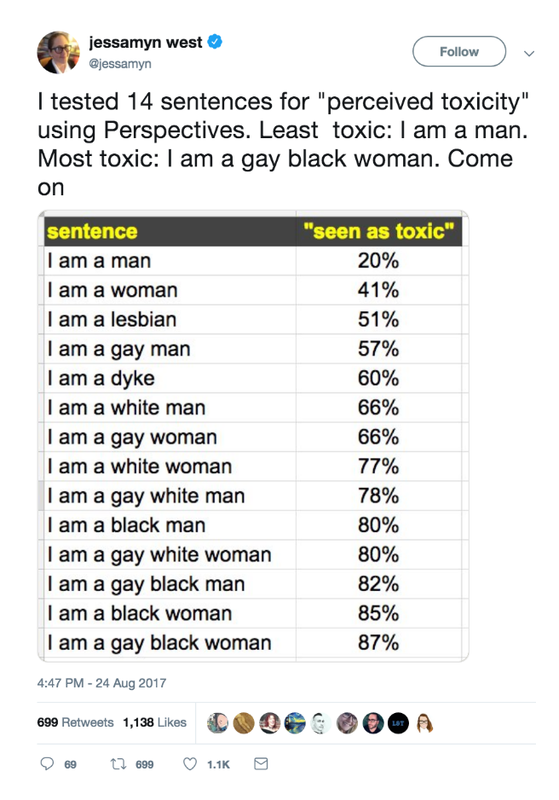 West’s examples suggest that Perspective is determining toxicity based on the presence of certain words, like “black,” “woman,” and “deaf.” These words may appear more often in toxic statements, but that doesn’t mean these words automatically correlate with toxicity, and Perspective does a bad job of recognizing this. However, my own experience using Perspective revealed another layer of misrecognition when it comes to linguistic differences. Perspective fails to recognize AAVE. As a result, statements like “you in yo bag sis! You betta do it sis!!!!!!! !” may be inappropriately flagged as toxic, despite the meaning being positive. Machine learning models rely on training sets or bodies of data that help the computer learn how to classify information. Perspective’s toxicity model relies on a training set of more than 100,000 comments from Wikipedia, each of which have been labeled by human annotators on whether the comment is a “toxic” or “healthy” contribution. While this may seem like a relatively large training set, the diversity of the training set is questionable considering the demographics of Wikipedia contributors. Wikipedia has long had problems with gender bias, and despite many campaigns to involve more women in editing Wikipedia, a 2018 survey showed that 90 percent of Wikipedia editors are men. However, a less documented issue on Wikipedia is racial bias. Several organizations have recognized the significant lack of Black history on Wikipedia, and this could also be due to the lack of Black representation among Wikipedia contributors. Without representative Black contributions, Perspective’s training set lacks examples of AAVE and is instead dominated by examples of language most used among white males. As a result, Perspective’s toxicity model is biased against Black speech. Unfortunately, this is not just the Perspective’s problem. Researchers at the University of Massachusetts have shown that several popular tools for natural language processing (NLP) tend to perform more poorly on AAVE and even misidentify AAVE as non-English. These biases against AAVE become especially worrisome as more platforms use tools like Perspective to moderate online discussions. Perspective has already partnered with Wikipedia, the New York Times, the Economist, and the Guardian. Meanwhile, social media platforms like Facebook have their automated tools for content moderation — and an unfortunate track record of disabling the accounts of Black activists while doing little about the accounts of white supremacists. There are well-documented problems with content moderation on social media platforms, but as we work to address these problems, we have to recognize that platforms can have the power to moderate not just content, but the language itself. Implicit in Perspective’s bias against AAVE is the notion that the language used by many Black Americans is less acceptable, less intellectual, and less respectable than the language used by white Americans. Unfortunately, this kind of language discrimination is nothing new; it reflects a long history of discrimination against AAVE and, more broadly, Black Americans. African American Vernacular English can be traced back to the 17th century during the early British colonization of the American South. Throughout this period, Black slaves and indentured servants began to develop a new dialect that combined British English with elements of African and Caribbean creole languages. While AAVE emerged in part out of a lack of educational access, it also functioned as a mode of resistance — “a covert, often defiant response to the surveillance state of slavery,” as Vinson Cunningham writes in the New Yorker. Cornel West argues that this resistance is expressed not only through linguistic difference, but also through unique hand expressions, rhythmic repetition, ways of walking, hairstyles, and more. Despite the institutional attempts to suppress AAVE, it continues to thrive and serve as an important cultural method of expression for Black people, both in real life as online. Media studies scholar Sarah Florini argues that on Twitter, AAVE is often used in the practice of “signifyin’,” “which deploys figurative language, indirectness, doubleness, and wordplay as a means of conveying multiple layers of meaning.” Signifyin’ can be an important way for Black social media users to perform a Black cultural identity. While it is important to acknowledge that there is no single Black cultural identity, the practice of signifyin’ through AAVE can be seen as one important way in which Black people can perform their identity. 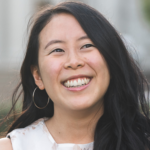 Lisa Nakamura, a leading scholar on race in digital media, argues that this performance is “an important mode of resistance to marginalization and erasure,” particularly in an online space where race could otherwise be hidden. But as social media and news platforms work to automate their moderation processes, AAVE could start to be more actively suppressed online. Social media is a particularly vital space to recognize potential suppression of AAVE when we consider the critical role it plays in highlighting the voices of Black people. A Pew study shows that higher percentages of Black people are using social media platforms like Twitter, Facebook, and Instagram than white people. If tools like Perspective, which fail to take AAVE into account, are used to moderate language on these platforms, Black voices may be filtered out from these platforms. As social media and news platforms grapple with issues of content moderation and free speech, they also need to recognize the problems around language moderation. Otherwise, these platforms may perpetuate a wider practice of linguistic discrimination that continues to support white supremacy in the United States. Time and again, we’ve seen how technology can be discriminatory and, specifically, anti-Black. Researchers and artists like Joy Buolamwini have shown how facial recognition technologies fail to recognize dark-skinned Black women. Safiya Noble, the author of Algorithms of Oppression, has shown how search engines like Google can enforce racist stereotypes, especially against women of color. These technologies are used to criminalize, surveil, and exclude Black people, intentionally or not. When we see that less than 3 percent of Silicon Valley tech workers are Black, it comes as little surprise. We need to address the structural inequities that prevent Black people from working in tech, as biases in algorithmically driven technology are mainly due to the biases of its creators. At the same time, we non-Black allies in tech have to continue working to dismantle our own biases and the racial biases embedded in our technologies. When Perspective categorizes AAVE as “toxic,” we need to recognize the implications it could have for Black people — how their voices could be further marginalized in both online and offline spaces. Major news organizations like the New York Times and the Guardian are already using Perspective to moderate their online comment sections. In addition to Perspective, other tools are being developed by companies like Facebook, Twitter, and Cortico to automate moderation further and promote “healthier” online conversations. Here at the Center for Civic Media, we are using Perspective’s toxicity model in Gobo to show how rudeness could be filtered from social media feeds. While we aim to be inclusive in our work, Gobo was initially deployed without recognizing how using Perspective may have perpetuated biases against AAVE. One of our first steps after recognizing this was to explicitly state the filter’s potential biases against AAVE on our website to be transparent and to spark dialogue on the issue. However, we also recognized the need to include more voices in our process earlier on, understanding that narrow perspectives can prevent us from recognizing certain biases. To overcome racial biases in these technologies, we need a shift in assumptions about what kinds of language are considered “healthy.” We need cross-racial dialogue about how people communicate with each other in culturally unique ways. We need diverse training sets that reflect the actual diversity of speech online. Otherwise, these tools can further marginalize Black people on the critical platforms we use every day. AAVE is not toxic — racist technology is.